Virtually eliminates gagging – Unique palate-free, patent-pending design engages the patient’s tongue to restrict the overflow of material and eliminate gagging! Take one impression, not two – You significantly improve the patient’s experience – the mouth is closed in a more natural, comfortable position. 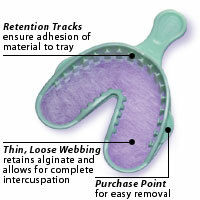 Alfa™ Triple Tray® requires about half the amount of alginate used in existing techniques. By simultaneously capturing upper and lower impressions plus the bite registration, significant time is saved – at the chair – where it counts most! Hands Free – Alfa’s closed-mouth technique frees the operator from holding the tray in place. While the material sets, the mixing area and utensils can be cleaned. Alfa Triple Tray offers a better presentation than unsightly reusable metal trays and avoids potential cross-contamination. 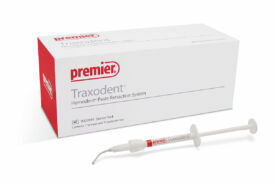 Alfa trays are disposable – no clean-up required. Innovative Tray – for a variety of products. 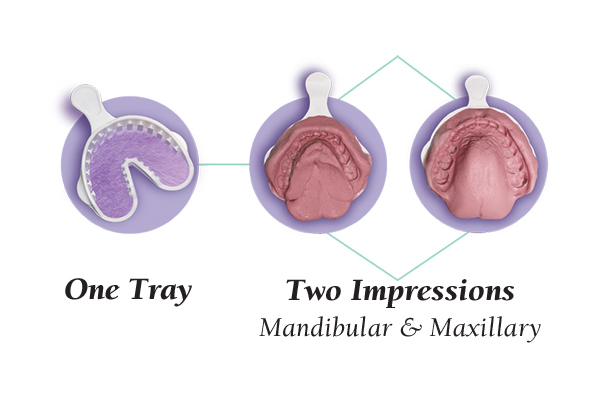 Alfa Triple Tray is ideal for full-mouth alginate impressions taken for the fabrication of custom trays, whitening trays, study models, night guards, athletic guards and as a matrix for temporaries. Also, Alfa can be used with alginate substitute vinyl polysiloxane (VPS) material. 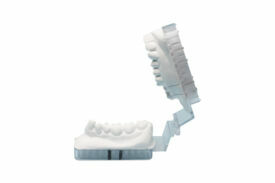 U.S. Patent #6,749,428 / ALFA™ Triple Tray® impression trays are single use, disposable trays. Using a tray with multiple patients may cause cross-contamination; take proper precautions.